Construction is moving forward on the Ritz-Carlton Residences Miami Beach at 4701 N. Meridian Ave., at the site of the former Miami Heart Institute. The seven-acre waterfront project comprises 111 condominium units and 15 single-family homes that will be priced from $2 million to more than $40 million. Delivery is expected in 2016 and the project is on schedule, said Lionheart Capital, the developer. The units will range from 1,700 to more than 11,000 square feet and will incorporate kitchens designed by Italian architect Piero Lissoni, oversized stone countertops, Gaggenau appliances and wiring for smart-home technology. Some will have private elevator foyers and plunge pools, according to the developer’s statement. The complex – which is set on what Lionheart says is the only lake in Miami Beach and is in the midst of an upscale neighborhood of single-family homes – will have 36 private docks, gardens, a waterfront social room, a private theater, spas, cabanas and other amenities. A landscaped half-acre rooftop pool deck will offer views of Biscayne Bay, Miami Beach and downtown Miami. A captained yacht will be docked on the premises for the use of owners and their guests. Lionheart purchased the Miami Heart Institute and adjacent parking lots in February 2012 for $20 million. At the time, Miami Beach city officials said the facility was in bad shape and ready to close down. The city was considering changing the allowed uses for it and South Shore Hospital, which is also being redeveloped as luxury residential housing. The Waves, being developed by Crescent Heights, would add 551 condominium units on the site of the former South Shore Hospital. It is to occupy two city blocks, running from Fifth to Seventh streets where the MacArthur Causeway meets Alton Road, on what is the largest privately owned land assemblage on Miami Beach, according to the developer’s website. The multi-use project will comprise office, retail, residential and outdoor spaces, the website said. 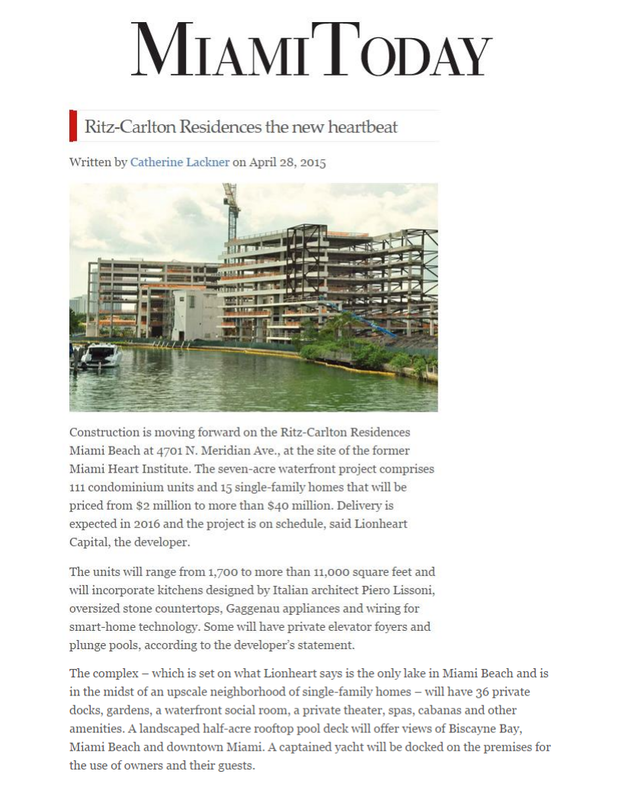 The Ritz-Carlton Residences Miami Beach is not owned by, developed by or sold by the Ritz-Carlton Hotel Company or any of its affiliates, Lionheart’s release said.